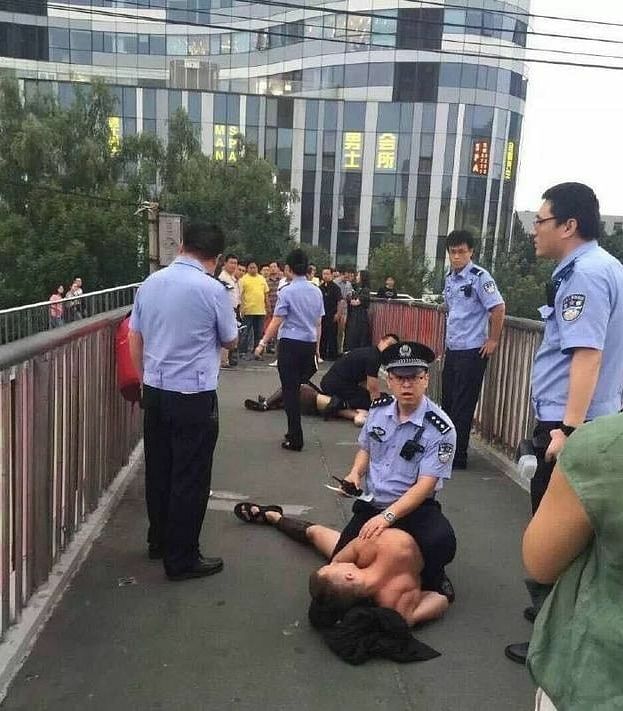 BEIJING (AFP) - Beijing police said on Thursday they halted the march of dozens of semi-naked young foreigners dressed as Spartan warriors because the muscular contingent had disturbed public order by drawing large crowds onto the city's busiest streets. Wearing dark capes and skimpy shorts as part of a restaurant marketing stunt, pictures of the foreigners went viral online, with some showing at least two of the performers pinned down to the ground by blue-shirted police. It was not clear whether any of them were arrested. Chinese media reported the incident on Thursday with headlines including "Beijing police put valiant Spartan warriors under control". Some images featured the warriors holding aloft cups of fruit and vegetables, rather than swords, with restaurant company Sweetie Salad saying in a statement it hired the "foreign models" to deliver food to customers to celebrate its first anniversary. The number of onlookers "far exceeded our expectations" and the police handling on the spot was "timely", it said in an apologetic post on its verified account on China's Twitter-like Sina Weibo. "We have deeply recognised that as a start-up company, we lack experience in organising large-scale offline activities," it said, adding it will "strictly follow the police's instructions" in future business operations to "ensure social order" is not affected. "We would like to thank the police again for their guidance and maintenance of our activity," it said. Chinese authorities are sensitive about events involving large crowds, particularly after a stampede killed 36 people on New Year's Eve in Shanghai. Beijing police said in a Sina Weibo posting that they stopped the show because it had "received reports from the public saying there were dozens of foreign males wearing shorts and attracting a crowd... (this) affected the order in the surrounding areas". Officers had "put some people under control" and police were working on the case, they said without elaborating.